Shaykh Hazim Abu Ghazalah was born on 3 March 1933, Yaffa, and was raised in Nablus, Palestine. By grace of Allah Most High, Shaikh descent goes back to our Master Prophet Mohammad (peace and blessings be upon him). He is a grandson of Sayyiduna Al-Hussain (may Allah be pleased with him). His family tree is duly authenticated. Early in his life, Shaikh studies Islamic law at the University of Damascus. Then he followed the senior Scholars of Tawheed at his time, like Shaikh Mohammad Al-Hashimi and Shaikh Abdul-Kader Iesa, may Allah be well pleased with them. Shaikh is a well know Sunni scholar of his time. 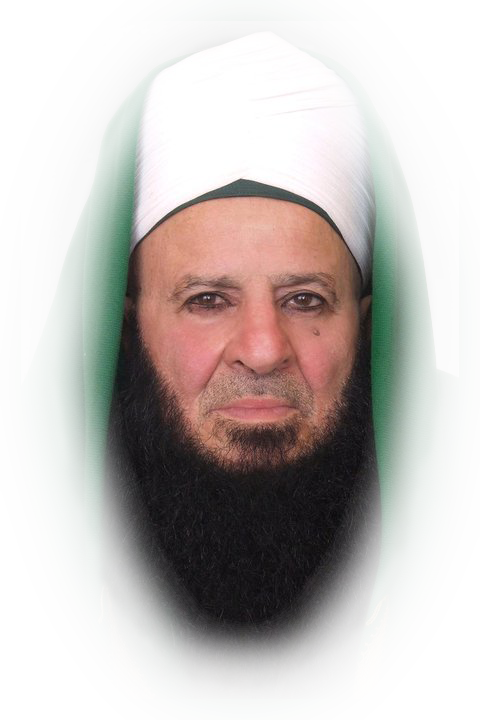 Shaikh lives in Jordan, where he heads Jam-e-Yatu Darul Quran Al-Karim, established in 1964. He is the Servant of Shadhili Qadiri Tariqah in Jordan. Masha Allah, Shaikh is peerless in his devotion. He is almost always fasting (except in eids). He makes three parts (60 pages) of the Quran in night prayer (tahajjud)in group. He completes reading the whole Quran at least three times a week. This number multiplies in Ramadan, despite the Shaikh’s numerous responsibilities. Shaikh establishes weekly sessions to invoke peace and blessings on our Master Mohammad (peace and blessings be upon him). His deputies worldwide run similar sessions. The total of the salawat (peace and blessings invocations) which Shaikh present as a gift to the soul of our Master Mohammad (peace and blessings be upon him) reaches billions. In addition thousands of Quranic complete readings, and thousands of fidya (70 thousand of La Ilaha Illa Allah). Despite his senior blessed age spend in promoting the way to Allah, Shaikh continuously makes overseas trip making due call to Allah Most High. Shaikh has millions of mureeds almost everywhere in the world. Shaikh has more than 25 books that focus on Islamic spirituality, monotheism, and personality development. The ultimate goals of Shaikh is build a Muslim Character emulating that of the Prophet (peace and blessings be upon him), while working on purifying the hearts to bring people closer to Allah Most High. In addition to Shaikh’s reputation of reading Quran by heart, he was known as a frequent visitor to the abodes of Sahabah (the companions of the Prophet peace and blessings be upon him). He believes they are alive in their souls, and spiritual connection is continuous with them. They return the greetings of those who greet them. If you have a question about Sufism & Islam, join our community and we will help you get an answer from the Sheikh himself!